John Joseph Silber, Ph.D., an improvisational trombonist who headed the Department of Music at the University of California, San Diego during the 1970’s, died March 7 at UCSD Medical Center. He was 82. Silber’s areas of expertise and courses taught covered a wide spectrum, including improvisational music, music theatre, American experimentalism, trombone seminars, performance seminars and conducting. He performed at numerous sites throughout the U.S. and at worldwide venues ranging from the Palais des Beaux Arts in Brussels, Belgium to Tasmania, Australia. A longtime resident of Del Mar, Silber served as a City of Del Mar Councilman, 1970-74. While serving on this volunteer post he also was named second chairman of UCSD’s embryonic Music Department, 1971-74. A native of Wheeling, W.Va., Silber served in the United States Navy during World War II. Joining the University in 1967, Silber retired in June, 1991, and was named professor emeritus in July, 1991. He spent nearly a decade working on a four-volume literary text on the nature of the modern age and its expression through music and movement. He was an expert on the experimental music of Ernst Krenek, Bernard Rands and Harry Partch and was a founding member of KIVA, a group of UCSD musicians who played throughout the world. One of his UCSD projects covered the development of new categories of thought and understanding in music based on impressionistic models and systems. 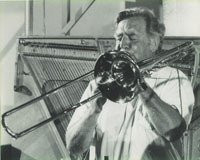 Tom Nee, a retired UCSD Department of Music faculty member, noted that “John was a remarkable, imaginative musician, particularly in improvisation. He could play Dixieland and traditional styles, but he had a group called KIVA that was amazing in its ability to improvise for 45 minutes or more and not repeat itself. In KIVA, he sometimes also played violin and other instruments. Silber received his undergraduate degrees at Eastman School of Music, University of Rochester, and his Ph.D. in conducting, theory and literature from Indiana University. Prior to joining UCSD he served as professor of theory and music literature at Illinois Wesleyan University, 1953-65, and professor of theory and music literature at Southern Methodist University. He spent a year as a visiting professor at York University, England, and also served as distinguished visitor professor at La Trobe University, Melbourne, Australia. Silber is survived by his wife of 55 years, Ann, and eight children: John of Fullerton; William of Chino Hills; Thomas of Rancho Santa Margarita; Mary Carlstrom of Chicago; Ann Crosbie of Fremont; Ellen of Santa Rosa, Paul and Richard of Del Mar; 14 grandchildren and two great grandchildren.